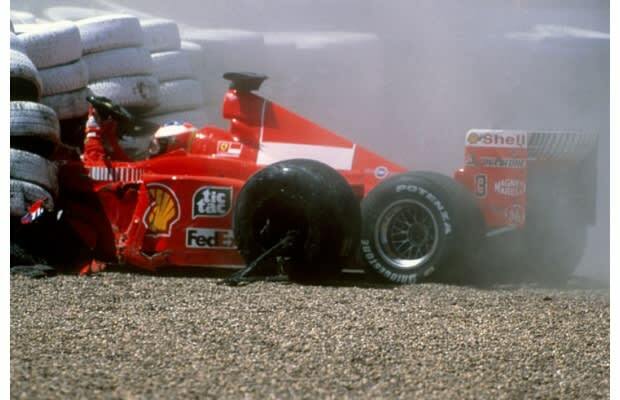 Complex Says: During the 1999 British Grand Prix, Schumacher experienced rear brake failure. He shunted off the track at a high-speed corner called Stowe, launching into a tire wall. He missed the next six races, but came back and grabbed pole position at the Malaysian Grand Prix. There was no hope of salvaging the Drivers' World Championship for 1999 at that point, but Ferrari went on to win the Constructors' World Championship with Schumi's help. As an exclamation point, Schumacher went on to win five of his seven championships after the accident, reigning over the sport from 2000 to 2004.